Stainless steel bowl with 3-quart capacity is an especially designed Japanese rice washing bowl for soaking and thoroughly washing rice before it's cooked. 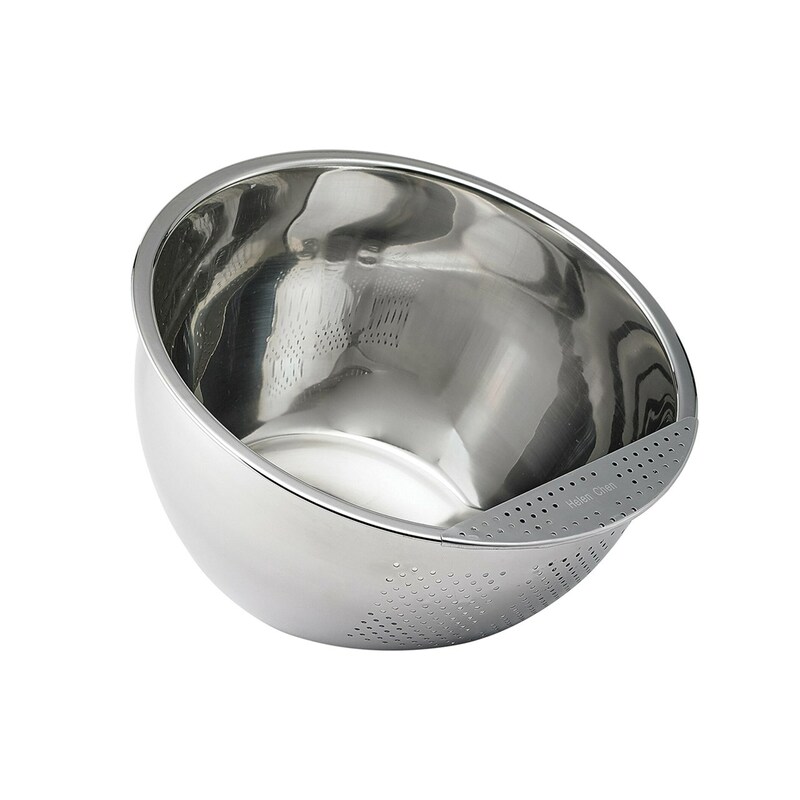 The flat solid base stabilizes the bowl for soaking and the perforated side strainer keeps smaller food in, allowing water and debris to drain out. The angled side helps in draining the water easily with just a simple tip onto its side. Convenient for making rice recipes that call for soaking the rice before it is cooked. Whether using brown rice, jasmine rice, basmati, wild, white and short grain rice, known as sticky rice due to its glue-like consistency when cooked, and other types of rice, a thorough cleaning in the Rice Washer can significantly reduce toxins and chemical levels incurred during the growing process. So easy to use. Simply measure in rice and add enough fresh water to cover it. Follow the recipe instructions for the amount of soaking time. 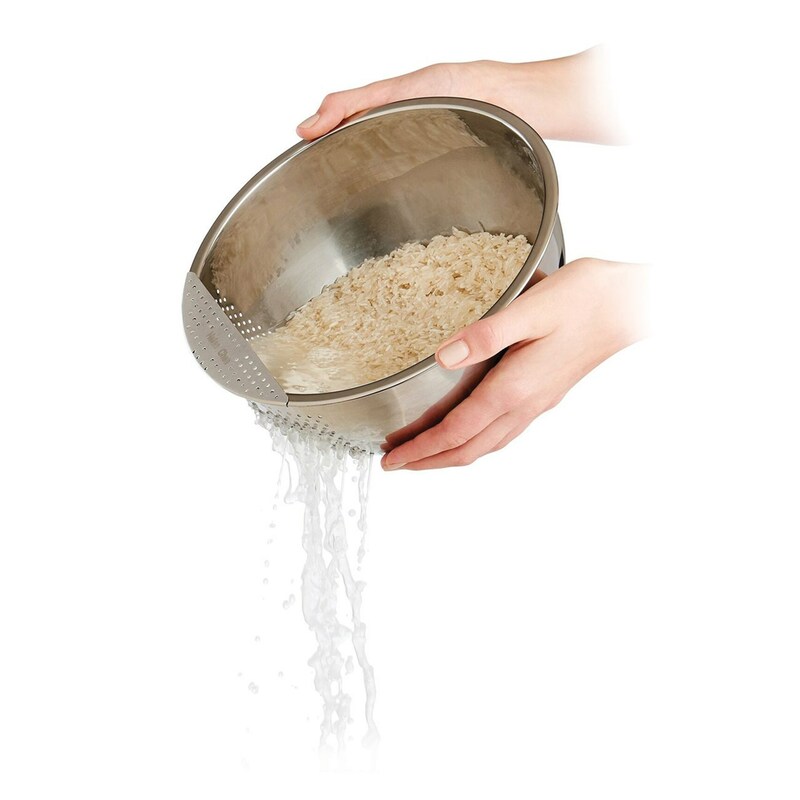 To clean the rice, cover it with fresh water and vigorously swish fingers through. Tilt the bowl on its side and drain. Loose bran, starch, and other debris will float on top of the water drain easily through the side strainer. Repeat until water is no longer cloudy. Doubles nicely as a multipurpose kitchen strainer for soaking and washing dried beans or grains like quinoa and barley, and soaking produce like berries and sprouts in a vinegar-water solution for more thorough cleaning. Lightweight and durable. Dishwasher safe for easy cleanup. Measures 8 7/8 in. diameter at top.